The first big decision was what to call the church. Names are not everything, but names matter. Names mean something, they say something about what you are about, they say something about the people who make up the church and they say something to the people in the community. Names can be immediately off-putting or appealing. And names create first impressions and leave lasting impressions. So, although other things matter more, names still matter. I’d be more than a little embarrassed to show you the page in my notebook dedicated to ‘name-storming’. Even more embarrassed if you saw the white board scribbles and post-its that once covered the walls of my office. But as Kevin Croft (my co-planter and Vauxhall based London City Mission-ary) and I batted ideas around we soon realised that it was necessary to sift through a massive amount of rubbish before we would hit gold. It meant that nothing was off the table; the meeting room was a safe-place to suggest stupid ideas. This article however, is not! We ended up with Hope Church Vauxhall. Hardly mind-blowing I realise. But that’s kind of the point. The creative in me wanted a clever hipster name. Something that would sound more like a Shoreditch coffee shop or a clever hashtag than a place of worship. But the need of the community rightly won over. Vauxhall is not Shoreditch. And the Vauxhall Park Gardens estate, where our church building is situated and our ministry will be focused, is certainly not. Vauxhall is a predominantly white working-class area. Social housing far outweighs both rentable properties and privately owned homes. Though sky-high council flats are uncommon the area is highly residential with four or five story blocks making up the majority of the estate. In much of the estate, particularly among the white working-class but also within the black community there is an inbuilt respect for the church. People value transparency, integrity and simplicity. Shame culture trumps guilt and family allegiances rule. There are pockets of the estate where everyone knows everyone’s business, and has done so for forty years. And most of all, you’re far more likely to hang out at a chicken shop than a coffee shop. What was needed was something short and sweet, something that would avoid unnecessary jargon but be clear about who we were and what we were about. And it needed to sound like a church – not a 90s boyband. More than that, it was a church for Vauxhall – place matters. This wasn’t going to be some commuter community – but a genuine local church. It’s a lot to ask from a name, but we were up for the challenge. And as the post-its slowly fell to the floor, one hipster hashtag at a time, one word began to stand out. Hope. It didn’t take too long to realise we had our name. So why hope? Simply put, it made sense. More than that, it is something that they genuinely want and know that they need. It’s not overtly Christian, we all need hope, though where we look for it will undoubtedly differ. It’s ordinary everyday language that actually means something. It’s an aspiration, an ambition, an expectation even. At its most basic it speaks simply of a dream for a better future. A life with a happier outcome. 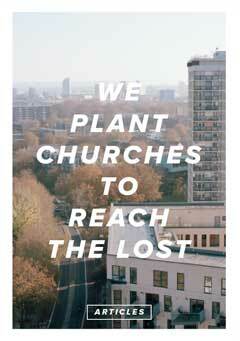 But for us, as a body of believers becoming a church in Vauxhall, it means so much more. Whereas on the estate hope is in league with finger-crossing and touching wood, for us Hope has a different face. The face of Jesus. Because Christian hope, the hope of the gospel, is a million miles from uncertainty. It is absolute confidence, complete certainty in something better, something awesome in the future. Our hope, Christian hope, is placed in the God who keeps his promises, whose Word never fails and who does what he says he will do. And who, in Jesus Christ has done, finished, smashed, completed, what was necessary for this certain hope. And so we had our name - Hope Church Vauxhall. It says something positive to the estate. But it means something greater to the church. In another life I might have found myself working in design and advertising, and having an eye for design has been an unexpected bonus for starting a church from scratch. Being a visual person the branding of Hope Church Vauxhall was probably noticeably higher on my list of church planting essentials – perhaps, if I’m honest, higher than it should have been. When it came to design and branding we wanted something that would look and feel like Vauxhall. So, squeezed between meeting with the growing launch team, prayer (a planting non-negotiable) and getting stuck into the ongoing ministry of London City Mission in the area, my ‘market research’ began. My ‘market research’ consisted of wandering around the estate and heading to all the places where people hang out. Though Vauxhall lacks a traditional high-street, the Vauxhall Gardens Estate does have a central crossroads with a dog-groomers, newsagents, and an internet café (Solomon’s) where many locals sit for hours and hours people watching (it is, without doubt, the place to go to find out what’s going on). But, at 3:30 and 9:30 there is one place to be - Tennessee Express: Vauxhall’s finest fried chicken shop. All these shops shaped our branding, the no-nonsense all-caps friendly but thick font quickly found its way into the logo. But Tennessee Express, and more widely the ever growing Chicken Shop culture of South London, was the driving force. Since reading this my wife has gently reminded me that the fast-food direction was her idea, though I’m not convinced. However, I reckon there is a pretty good chance that we are the first church to model its branding on a fried chicken shop. “Chicken-shop yellow” and “Chicken-shop white”. The rest of the design quickly fell into place, with help from our Co-Mission partners and ‘mother church’ The Globe and their gifted digital media man James. Because location is so key we wanted Vauxhall to be more than a side-note. Not only this but we also were aware of the dangers of location making the church sound like a franchise (just ask any member of a ‘Christchurch’, ‘Grace church’ or ‘Cornerstone’). From this desire came our Hope Church V, that sits snuggly behind the word Hope and creates the dual impression of both locating Hope in Vauxhall like a google maps pin, and launching hope from Vauxhall in an unintentionally Superman-esq fashion. The result (though I say so myself) is a bold and clear brand that stands out. God-willing, the people in Vauxhall Gardens Estate will see it and note it. The long term London City Mission Christian witness in Vauxhall will have a new and noticeable facelift. The church that will soon be meeting in this place will have a name that says something about who we are and what we do. Something that reminds us that we are a body whose focus is to know and love and to preach Jesus, the message of hope in the heart of Vauxhall. However, all this is just packaging. And, though you might choose which gift to unwrap first based on the quality of the wrapping paper it is soon scrunched-up on the floor, being chewed by the dog. The reality is that understanding Vauxhall, getting to know the place and the people has driven so many decisions. Because, though the Bible is clear on so many things about what church is (a local body not a lovely building for starters) and how it should run, God has generously given us freedom to work out what that looks like in a particular place in the world and at a particular time in history. Although it is vital that we don’t shift from, change or reject the non-negotiable objective truths of the Gospel that first saved us and now compel us to plant churches, it is equally vital that we remember that every time Gospel truth is communicated it is done so within a particular context. This is no more obvious than when planting a church. I can’t pretend to be a local lad from Vauxhall Gardens Estate, nor a single mum from Ethelred. But I can work as hard as possible to do what I can to step into their trainers. Paul, in his letter to the Corinthians models this brilliantly when he speaks of becoming ‘all things to all people, that by all means I might save some’. When it comes to church planting, faithful and biblical understanding of the context is key. And this principle has shaped almost all of our decisions. Becoming all things to all people means that we don’t go the pub with the best selection of craft beers but the one where the lads on the estate drink and work. It shapes what I wear during the week and will shape what I wear to preach on a Sunday. My wardrobe looks significantly different now than it did six months ago. It shapes the language I use (within reason), the shops I go to, the barber I choose, and where I buy my lunch. Don’t get me wrong, I’m hardly Hudson Taylor learning Mandarin and growing a pointy beard to reach Shanghai, but in Vauxhall I (a middle class midlander) am an outsider – and this stuff matters. When we start meeting as a church on Sundays and in the week it will shape the timing and style of the service. It will shape the language in our liturgy, the style and fonts of our service sheets, the taste of our coffee. It will shape the songs that we sing (and the ones that we don’t). It will shape the food that we eat together. It will shape the way that I preach, shaping the style without swapping the substance or message. As we start meeting as a church, my challenge to our launch team will be this - get ready to get uncomfortable. Because Hope Church Vauxhall is not just for them - and if they love almost all of it there is a good chance that locals will love very little of it. And we will have to keep learning. This stuff isn’t simply pre-plant research that is left at the launch. Shaping our ministry will be an ongoing art. This will mean continuous buy-in and hard work from the church family. Where possible the whole church will be involved in door-to-door work on the estate – a vital ministry to ensure we know the community and they know us. We will aim to be out in the community far more than we are gathered in our building. Over the next ten years Vauxhall will likely change significantly and the redevelopment of Oval, Nine Elms and even Battersea sends gentrification-shaped ripple effects into the area. If we are to be a church in Vauxhall for Vauxhall we need to be well prepared for that change. I’m buzzing for the start of Hope Church Vauxhall. Our first teaching series is in the book of Philippians, a letter to a church plant that was started when God opened the heart of God-fearing woman named Lydia and she responded to Paul’s message of hope. God has been really gracious in the last few months and, thanks to the ongoing work of London City Mission we are pretty likely to have a scattering of Lydia-like non-believers at our first Sunday gathering. So pray for us. Pray for Vauxhall. Pray that as we plant Hope Church in the heart of the place, the message of hope will be planted in the hearts of the people. Why not join me in praying Paul's prayer in Philippians 1, both for the faithful sacrificial hopeful Christians in the launch team and the in-need-of-hope men, women and children who live, work and play in Vauxhall. "And this is my prayer: that your love may abound more and more in knowledge and depth of insight, so that you may be able to discern what is best and may be pure and blameless for the day of Christ, filled with the fruit of righteousness that comes through Jesus Christ—to the glory and praise of God."